Overcoming the Tensions and Challenges of Technology Integration: How Can We Best Support our Teachers? 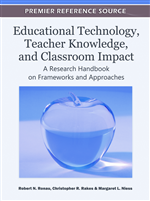 This chapter informs teacher educators and individuals involved in teacher professional development about the tensions that frequently arise when K-12 teachers integrate technology into their classrooms. Suggestions for how individuals can help teachers confront and overcome these challenges are presented. In order to describe the various tensions that exist, findings are organized around concerns that are related to the innovator (e.g., the teacher), the technological innovation, and the contextual factors that arise from the environment in which teaching and learning occur. To describe ways to assist teachers as they confront the challenges of technology integration, recommendations are framed around the Cognitive Apprenticeship Model (CAM) and the four dimensions that constitute a successful learning environment: content, method, sequencing, and sociology. As part of a movement throughout the United States to integrate 21st Century skills throughout K-12 classrooms, various states are engaged in new initiatives to infuse the “four Cs” (critical thinking, problem solving, communication, collaboration, and creativity and innovation) throughout their curricula (Partnership for 21st Century Skills, 2004). An emphasis on 21st Century skills brings with it an increased recognition of the role of technology in today’s digital age society. Because of this emphasis, there has also been a heightened focus on the integration of technology in K-12 classrooms and increased recognition that teachers must be prepared to provide technology-supported learning opportunities for students. Despite this push for technology integration in K-12 classrooms, little technology is actually being used in classrooms in meaningful and transformative ways (Cuban, 2001; Hennessy, Ruthven, & Brindley, 2005). In fact, when technology is integrated into classroom instruction, few teachers radically alter their teaching practice in ways that motivate students, enrich learning or stimulate higher-level thinking and reasoning, in support of 21st century skills (Cuban, 2001; Goodson & Mangan, 1995). There are various reasons why teachers might not take advantage of the educational power of technology, some of which include limited access to technology, insufficient technological support, and teachers’ own limited knowledge of the literacies that surround new technologies (Hennessy et al., 2005; Reinking, Labbo, & McKenna, 2000; Zhao et al., 2002). Yet even when these barriers do not exist, educators are still confronted with the fact that in order for the highest likelihood of integration to occur, teachers must value technology integration and see compatibility between its uses and their own existing values and beliefs (Zhao et al., 2002). According to Straub (2009), successfully facilitating a technology adoption “needs to address cognitive, emotional, and contextual concerns” (p. 626). Ronau et al. (2010) describe a three-dimensional model for teacher knowledge that recognizes the complexities and interactions that surround the knowledge that is required for integrating technology into classrooms. In addition to acknowledging exposure to the pedagogy of technology integration, this framework also points to contextual and environmental factors that must be taken into consideration when exploring the relationship between teacher knowledge and the integration of technology in classrooms. If educators are going to use technology in ways that are not simply seen as extensions to conventional print-based literacy while favoring skills such as critical thinking, problem solving, collaboration, and creativity, many of them will need to shift the educational philosophies that guide their instruction (Smolin & Lawless, 2004). In addition, they will need to take into consideration the ways that these various factors interact with one another. To help educators confront the many challenges they might face when integrating technology into classrooms, this chapter investigates research on technology integration and teacher education. It explores what challenges can arise as teachers learn to use technology to support teaching and learning. It also investigates how others have confronted these challenges to explore how preservice and practicing teachers have been successfully supported in this learning process. The purpose of this chapter is to share these findings so that educators are better informed about the challenges that frequently arise when teachers are asked to integrate such technologies into classrooms. In addition, it offers suggestions for how teachers and teacher educators might confront these challenges.